In a noteworthy case of Filipino ingenuity, the shortage of tomatoes during the second world war would lead food technologist Maria Orosa to create a version of ketchup that used an alternative fruit more ubiquitous in these parts: banana. Rather than copying from its Western tomato-based counterpart however, most versions today take on a sweeter, tangier, and/or spicier edge that especially works with many of the dishes well-loved by Filipinos, either as a cooking ingredient (as is the case in Filipino sweet spaghetti) or as a sauce or dip (e.g., with tortang talong and Filipino-style fried chicken). Today you’ll find a number of brands on the market, each of which have their own following: UFC, Papa, Jufran, Mafran, and Del Monte. The first four brands (all except Del Monte) are in fact manufactured by the same company, NutriAsia, which admittedly gets us skeptical. But the real question on our minds is, how do they taste? One of the most popular brands of the bunch, UFC offers a great balance of sweetness, saltiness, tang, and just enough of a peppery heat to give any dish a spicy kick. Its standout feature is its thickness, which makes it a bit difficult to pour out from the bottle without a couple of powerful shakes, but also makes it great for dipping into as it easily clings onto any kind of food. Though generally similar to UFC in flavor profile, Papa takes on a less spicy and less salty direction, which better showcases its tanginess. Present, too, is a red bell pepper-like note that especially reminds members of the team of the sweet spaghetti they had growing up. With a consistency that’s just at the midpoint of thick and runny, Papa is great both for all-around dipping and cooking. Extremely popular in the country and even exported abroad, Jufran is best known for supplying to local chain Max’s. Though thinner and runnier than we’d like (for a ketchup, at least; note that for international export, Jufran is peddled as a banana sauce), it has the brightest, tangiest flavor of the bunch that does wonders to uplift its sweetness. This makes it great for pairing with food that’s salty and rich—like the fried chicken or the kamote fries from the said local establishment. Mafran and Jufran take on oddly similar names and use similar fonts on the packaging—points which turn out to be remnants of the intriguing backstory behind the two brands (both of which are nonetheless manufactured by food company NutriAsia—just like UFC and Papa). Mafran is similarly runny as Jufran, just a degree thicker, but has a markedly different taste that leans more toward predominantly sugary and lacking Jufran’s telltale tang. It does the job of adding the needed sweetness to many dishes, but lacks the acidity or spice to give any other flavor dimension. 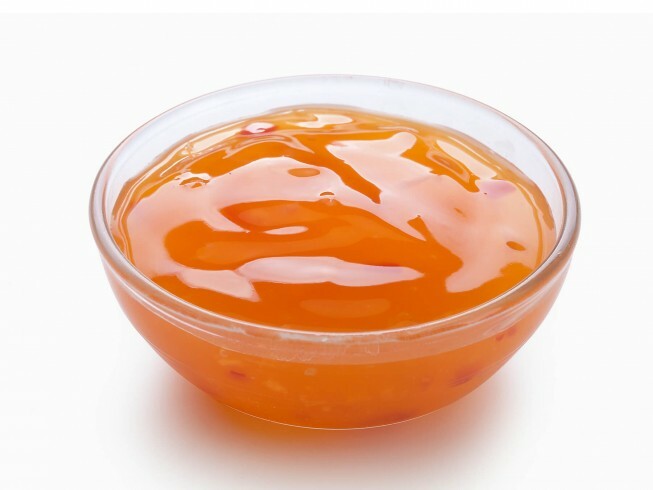 Del Monte’s differs radically from the rest of the bunch not only by being manufactured by a different mother company and with its sweet and sour sauce-like translucent orange hue and goopy consistency, but also by having a flavor that reminds us more of typical Western tomato ketchup, just made sweeter. Still, its similarity to the tomato version and relatively natural-tasting flavor makes it a safe choice “gateway banana ketchup” for those who aren’t into the other brands (this author admittedly included) but still want a banana-based alternative condiment. With its thickness and well-balanced, tamis-anghang classic banana ketchup taste, UFC’s banana ketchup is our top pick that’s great for all-around dipping, cooking, or straight-up eating (?). Still, each brand has its own distinctive taste and consistency that make them special in their own way. For a similar-tasting but runnier sauce for spooning onto your rice, go for Papa Sweet Sarap. Meanwhile, Max’s chicken fans looking to bring home a taste of the restaurant’s signature sauce can count on Jufran. Sugar devotees (or those who love salty dishes and need a sauce sweet enough to balance it out) will appreciate Mafran. And for the banana ketchup skeptic, Del Monte is your best bet. Whichever brand you end up putting in your grocery basket, you’ll be rewarded with the ketchup’s characteristic burst of sweetness and spiciness you won’t find anywhere else. Try Davao’s Queen’s banana catsup. Its so good! From the land of bananas. Made by local supplier Pearlgold Ent. I used to be a ketchup guy. I used to put it on literally every single savory dish I ate(yeah, even Sinigang na Baboy, weird.). But it each serving really packs a lot of unnecessary carbs. But seriously though, they make a lot of food better. Go for Jufran, Papa, and if you go after quality, Del Monte. Hi Joe, thanks for the tip! Any idea where we can get that in Manila?